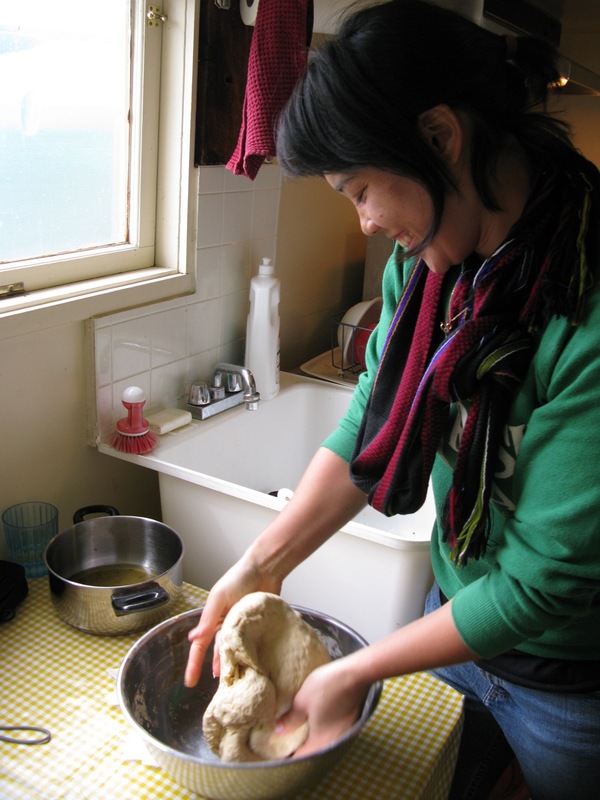 Jess's Many Mini Adventures in Food and Farming: Do the Onion! A couple of weeks ago, the folks at Heritage hosted a huge birthday bash. There was a bonfire and a dessert competition, and of course, dancing. The moves came naturally with the fire flickering behind us, the "world music" dropping a sick beat, and all of us hitting our energy peak from the intense shots of sugar. But it wasn't until Tarka, the son of Farmer Tim and his wife Debbie, invented "farm dancing" that the fun really got started. We had "driving the tractor" and "cleaning the carrots" and "cutting lettuce," but my favorite was "harvesting onions" -- a move reminiscent of the scene from Legally Blonde where Reese Witherspoon teaches an entire salon-full of women to do the "bend and snap." 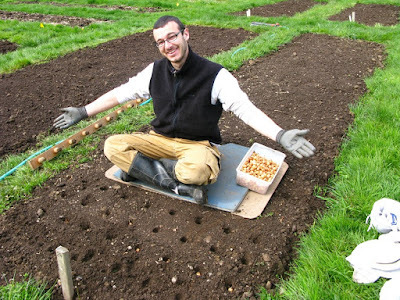 Anyway, the dance moves came in handy this week when we harvested out 5 beds of gorgeous white and red onions. 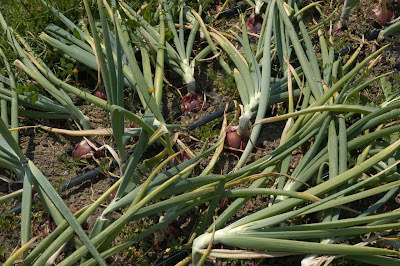 The water had been off in the onion beds for a couple weeks and thanks to a spate of extremely hot weather last week (bad for nearly everything else, but good for drying onions) these bad boys were ready for harvest. 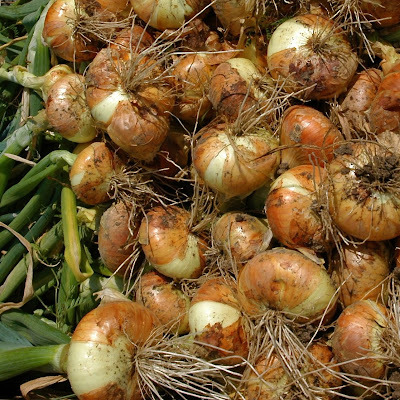 We've been selling the Stuttgarter onions for the past few weeks as "fresh onions," peeled down to a clean pearly white with the long green tops still attached. The pretty leaves which had been perky, tall, and deliciously crisp just a couple weeks before were now droopy and wilted and pretty unappetizing. 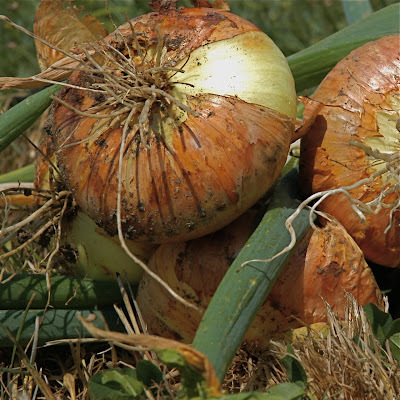 The ordered forest of upright onion tops gave way to limp, yellowing chaos. Between four of us, it took a couple of hours to get everything out and stored on the shelves in the barn to dry. 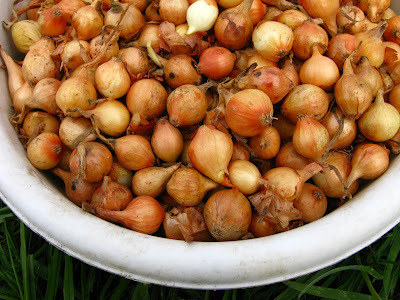 2-3% of the onions were rotten or split, but the hundreds of others were gorgeous and had already started developing the lovely crisp paper skins that will protect them from mold and keep the farm in onions until springtime next year. 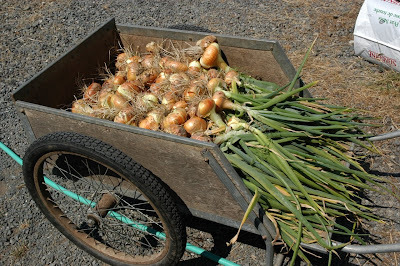 We carried the onions up in wooden carts to store on the drying racks in the barn. Susan was surprised at our yield because the onion starts we used were disappointing this year. 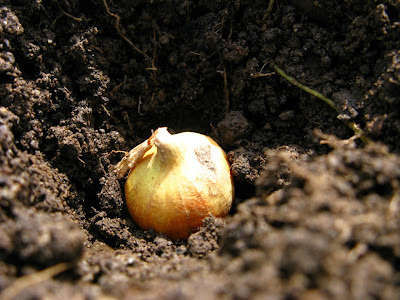 Back in mid-April when we planted the onions, Lucy, Colin and I handsifted through hundreds of the tiny bulbs and discarded nearly 40% that had green and black mold on the root side. 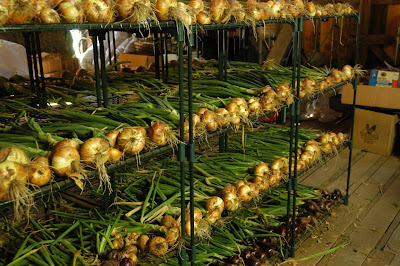 Sorted Stuttgarter onion sets -- one onion grows from each of these. 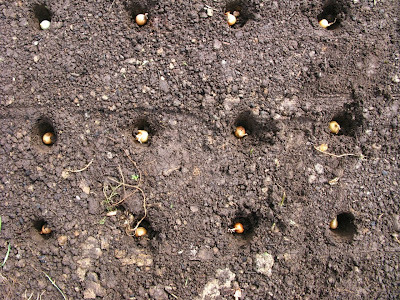 We placed each mini onion by hand into a small hole about 1.5'' deep -- root side down, shoot side up -- and covered each one up with a little soil. 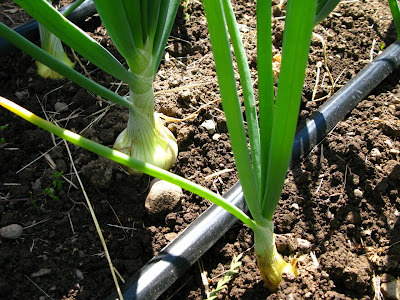 Eventually, the baby onions grew up and started looking like the real thing. 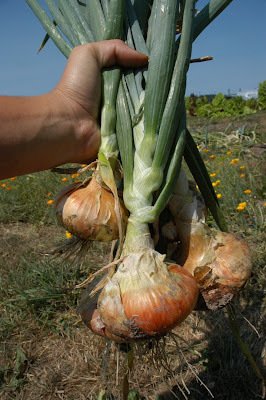 One day, when I have my own market garden or farm, I want to try to plant shallots and lots lots more red onions. They're so very beautiful and so yummy raw in salads and raita and all kinds of other stuff. I had cleared all the garlic off the shelves last week -- cut off the stems and stashed the bulbs in a cabinet to continue to dry. 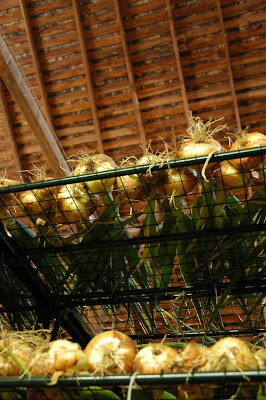 So the onions have taken their place in the barn. They'll air out there for a couple of weeks until their white necks are completely dry. In places with drier climates, many folks leave their onions outside to dry for a few days, but here on the islands where it's 105 degrees one day and 50 and foggy the next week, it's safer to keep our bounty in the barn until we're ready to cut off the greens and store them in mesh bags. Once the shelves are clear, it's on to potatoes!